Reiki is a Japanese technique for stress reduction and relaxation that also promotes healing. It is administered by "laying on hands" and is based on the idea that an unseen "life force energy" flows through us and is what causes us to be alive. If one's "life force energy" is low, then we are more likely to get sick or feel stress, and if it is high, we are more capable of being happy and healthy.The word Reiki is made of two Japanese words - Rei which means "God's Wisdom or the Higher Power" and Ki which is "life force energy". So Reiki is actually "spiritually guided life force energy. "A treatment feels like a wonderful glowing radiance that flows through and around you. Reiki treats the whole person including body, emotions, mind and spirit creating many beneficial effects that include relaxation and feelings of peace, security and wellbeing. Many have reported miraculous results.Reiki is a simple, natural and safe method of spiritual healing and self-improvement that everyone can use. It has been effective in helping virtually every known illness and malady and always creates a beneficial effect. It also works in conjunction with all other medical or therapeutic techniques to relieve side effects and promote recovery.An amazingly simple technique to learn, the ability to use Reiki is not taught in the usual sense, but is transferred to the student during a Reiki class. This ability is passed on during an "attunement" given by a Reiki master and allows the student to tap into an unlimited supply of "life force energy" to improve one's health and enhance the quality of life.Its use is not dependent on one's intellectual capacity or spiritual development and therefore is available to everyone. It has been successfully taught to thousands of people of all ages and backgrounds.While Reiki is spiritual in nature, it is not a religion. It has no dogma, and there is nothing you must believe in order to learn and use Reiki. In fact, Reiki is not dependent on belief at all and will work whether you believe in it or not. Because Reiki comes from God, many people find that using Reiki puts them more in touch with the experience of their religion rather than having only an intellectual concept of it.While Reiki is not a religion, it is still important to live and act in a way that promotes harmony with others. Dr. Mikao Usui, the founder of the Reiki system of natural healing, recommended that one practice certain simple ethical ideals to promote peace and harmony, which are nearly universal across all cultures. This facial offers a relaxing experience, while nutring and beautifying the skin. It includes a Shiatsu facial massage and the application of a gel and a crystal maskHolistic TreatmentThe technique of the Cristal Theraphy uses the precious and semi-precious stones that, you bring on, or simply mails in you determine zones of the body, they seem to be able to neutralize the discords.In the human experience the crystals influence in all the energetic trials and can be used for helping the people, to improve the environments to facilitate the relationships that we have with the others and with the objects.The crystals and the hard stones are precious allies that can help us to take care of the our emotional body.The power of recovery of the crystals is known since the night of the times. All the cultures have used the crystals to improve their life, and today we have available what it stays of these ancient wisdoms together with modern techniquesA characteristic commune to all the crystals is the ability to amplify all the energetic trials.The meditation with the crystals is deeper, the processes of recovery are accelerated, the states of conscience are intensified.The Cristal Theraphy cannot be enumerated among the medical sciences, but rather must be consideed as an energetic technique that, exploiting the strong position of positive energy attributed to the cristals and to the gems, it returns equilibrium and it favors in the individual the natural resumption.In fact, the appreciated stones are him to consider, because of their atomic structure, among the most perfect things of the world.They spreads pure light, they are bearers of energy that can surrender to the man, that is able of to absorb it.This energy practices its influence both to physical layer, and psico-emotional and above all it intervenes against the discords that come to create him for varied motives, that damage life.Substantially the crystals send forth some frequencies that enter resonance with our organism with the other living beings and the inanimate objects.You understands therefore that their field of employment is vast and that they have the ability to harmonize our inside trials as the relationships. Most of us are aware about the health benefits of fresh fruits, and we also know that most of the nutrients and vitamins in fruits lie in their skin and pulp, and just as they are useful to the body, these nutrients can serve to be excellent scrubs or re-vitalisers for our skin too! 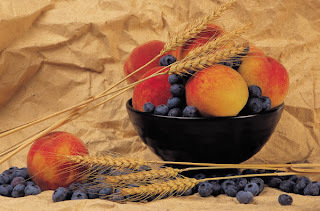 Natural Fruit Facials have been preferred since centuries to get a healthy skin that glows. If you know the properties of each fruit, you can pamper yourself with an all-natural fruit mask. This may seem like an off-topic post, but seriously, it has been wonderful to use some of my mushy fruits to pamper my face over the weekend! And as I'm sure every woman loves pampering, I thought I'd share with you these simple tips! Different people have different skin tyes, and each skin reacts differently to a fruit mask. So its advisable to know your skin type first before using any products on your face or skin, and even after that, always test a small area of your skin, preferably the elbow. recipesBefore & After a Fruit FacialWhen using any fruit mask, wash your face and neck before applying the mixture. Apply the fruit mask gently with your fingertips, avoiding the delicate area around your eyes and lips. Leave the mask on for 15-20 mins, then wipe your face with a soft warm towel and rinse your skin thoroughly with luke-warm water. After this, splash some ice-cold water on your face to tighten your pores, then finish by applying a coating of light lotion (with SPF 15 or higher) over your face. Listed below are some common fruits that can be used as face-masks due to their specific medicinal properties. Again, DO NOT use any of these without a proper patch-test on your skin to see how it reacts to these fruits. The alpha hydroxy acid (AHA) in peaches makes this a great mask for general skin renewal. It helps reduce wrinkles, remove dead skin, and clean your pores. Combine it with some cooked oatmeal or yogurt and use the puree as a facial. The oatmeal helps to heal irritated skin and moisturizes, as does the yogurt.AvocadosAvocados offer your skin the antioxidant effects of Vitamin E. The proteins and fats in the fruit draws moisture into your skin and helps fill up the fine lines & wrinkles. Mash it with 1 egg yolk and apply to face for 20 mins, then wash it to soothe and smooth dry skin; this is especially good in summers. Bananas contain vitamins A, B, C, and E as well as potassium. They smooth and nourish your skin while the antioxidants purify it. Mash half of a ripe banana with two tablespoons of honey and four tablespoons of sour cream( for oily skin, use two tablespoons of lemon or orange juice for the sour cream), apply on your face for 15 mins and wash off for instant glow. A member of the rose family, strawberries contain salicyclic acid, which rids the skin of dead cells, allowing it to absorb moisture more efficiently. Strawberries also have a mild bleaching effect on the skin and help heal blemishes. Just puree 1/2 cup ripe strawberries with 1/4 cup cornstarch; apply for 30 mins, then rinse off with cool water. The silica in cucumber is an essential component of healthy connective tissue,and helps improve the complexion and health of the skin. The high water content makes it a natural moisturiser, while the ascorbic acid and caffeic acid in cucumbers prevent water retention (puffy eyes and dark circles). You can rub it raw on your face, or use a cucumber facial recipe to instantly rejuvenate your skin. works great when you choose a fruit that is right for your skin type. Eating them daily is the best way to get a healthy skin, but when you need some instant glow for a party you have to attend in 12 hours, these fruit facials can come in real handy! Plus, it gives you a chance to relax for 30 mins as the invigorating smell fills the air while the fruit pulp works wonders on your skin! Remember, there's nothing better than using fresh natural products for your skin; let me find a fruit facial recipe that works for you, and pamper your skin from time to time, because both you and your skin deserve to look healthy and beautiful! What are alpha- and beta- hydroxy acids and why are they considered cosmetic helpers? We are interested in exfoliating and getting rid of old, dry cells that clog up our skin. As we mature, our skin loses some of its ability to slough off these dead cells. They stick on so hard that ordinary washing won't loosen them off, so that a thicker layer of them accumulates on the surface. This prevents new skin cells from surfacing and functioning as best they can, which in turn leads to dry, flaky skin, wrinkles, and a less elastic skin texture. Our lotions and creams are less effective on such blocked skin, too. The hydroxy acids, like all acids, dissolve organic matter and are used in commercial cosmetics as exfoliant ingredients for that reason. While the FDA warns against use of percentages higher than 8% in cosmetics, we need not be concerned as they are referring to concentrated extracts and synthetic derivatives, not the mild preparations we make from blended fresh apples, strawberries, and avocados. how about oily skin and acne? Yes, these natural acids are good for acneic skin too. When pores and sebaceous glands become clogged with dead skin cells, the oily substance sebum stagnates in the tissues. Bacteria invade and thrive; white blood cells enter and fight them, creating pus, and inflammation rounds out the not-so-pretty picture. The hydroxy acids, in dissolving the sticky layers of waste material, allow sebum and blood to move in the tissues freely, so that acne is not so likely to form. Beta-hydroxy acid is suitable to oily, acneic skin with blackheads and whiteheads, as it has the ability to enter sebum-laden pores and dissolve the dead cells inside them, which alpha-hydroxy acid doesn't. (A-hydroxy acids dissolve in water; b-hydroxy in fats.) Beta-hydroxy acid is basically salicylic acid, present in willow, yarrow and pansy leaves. reduction of fine lines, smoothing, healing (to some degree), moisturizing and prevention of wrinkles, evening out irregular color, combating acne, helping our sunscreen and everyday moisturizers to work better. Impressive, huh? Well, here are some basic methods for you to vary according to your needs. You can use fruit masks twice a week. 1. Open up the pores and make your skin accessible to the good stuff in the fruit. Do a quick herbal steam. (This is however NOT advisable for people with thread veins.) Simmer 2 tablespoons of mixed lavender, chamomile and comfrey leaves or calendula flowers in a quart of water. Violet leaves and red clover flowers are nice too. Make sure the pot is covered. While the herbal tea is simmering, prepare your fruit mask. Mash the selected fruit, or blend it up. Squeeze the juice out of it. Put the mashed pulp aside in a cool place. Note: if you prefer to use a quicker method for making the herbal steam, heat the quart of water to a comfortably hot temperature (as for a bath), and add up to 4 drops of eos (lavender, chamomile, rose otto, patchouli - or simply your favorite.) Stir the eos into the water gently. This is somewhat less effective than an herb tea, as you can't use water quite as hot, but it's good too. Tie your hair back or wrap it in a turban so it won't get in the way. Remove the pot from the heat, put it on a table and sit down in front of it. Take the lid off and cover both the steaming pot and your face with a big bath towel, keeping your face about 8 inches from the steam and turning it from side to side occasionally. Stay in the steam for 5 minutes. 2. Magic Fruit MaskYou have to give the nutrients in the fruit time to penetrate the skin and do their work, so the treatment of choice is the facial mask. Apply the fruit pulp to your face, avoiding the area around the eyes, and rest for 10-20 minutes. Take a bath in the meantime. Or put on some peaceful music, hang a "Do Not Disturb" sign on your door, then go lie down. Let your thoughts go to pleasant places. Rinse your face first with warm water, then with cool. Feel the firm and smooth difference to your skin. Below is a chart for skin types and the fruit appropriate to each. Don't feel constrained to select only ingredients from one column for your skin; blend and combine, experiment and see what's best for your unique self. 1. Mix a little honey into your apricot mash for extra antiseptic power and moisturizing. 2. Blend your Vitamin A-rich carrots with a little yoghurt, kefir or buttermilk for extra alpha-hydroxy acid (lactic). 3. Peel the citrus and remove the white pith. Mix the pulped fruit with a little oatmeal or cornmeal to have a spreadable mask. 1. Blueberries are especially good for those with thread veins. 2. Blend some buttermilk or kefir with mashed avocado for rich skin nourishment. 1. Peel tomatoes and discard the seeds. Mash the flesh and blend with oatmeal to have a spreadable mask. 2. Remember to make tea out of willow bark or yarrow or pansy leaves and blend it with fruit, for a powerful effect on blackheads and acneic skin. One last note: If you're going out into the sunshine after applying a fruit mask, make sure to put on sunscreen first. Remember, you've just removed some layers of old cells, and the new ones pushing their way up are tender and sensitive. In 1966, the Mas family acquired the Sothys Institute, already installed on the Rue du Faubourg Saint-Honore in Paris. Mr. Bernard Mas, Chairman, then decided to add to the beautiful Sothys range and increase its availability. Mr. Mas devoted himself to setting up distinctive export markets for Sothys products. From then on, Sothys became a family concern with an international vocation. Sothys then installed its main production, distribution and administrative facilities in Brive, towards the center of France. It is from here that Sothys' chemists, skin care specialists and marketing personnel worked to fill the life-long dream of the Mas family. In the late 1970's, Sothys opened the doors to the United States market. Here, under the direction of an esthetician, Mr. Christian Garces, Sothys continued its mark of excellence by bringing its French traditions to the American woman. 60 years after its creation, Sothys is stronger than ever, with distribution to over 100 countries worldwide making it one of the premiere professional skin care product lines ever. Brought to the United States some 25 years ago by Christian Garces, Sothys became an instant hit for estheticians looking for a professional, results- oriented product line. Over two decades later, it continues to be the forerunner in an extremely demanding industry. Much of Sothys' success is due to its focus on education. Not content to simply sell its products, Sothys offers continuous, complementary education to estheticians and therapists who want to learn not just about the products, but about the industry in general. At the Sothys Institute in Miami, and at regional Sothys offices across the Nation, classes are offered, with topics ranging from hands-on body workshops to cosmetic chemistry. Of course, the products themselves are the stars in the Sothys constellation. From creation to roll-out, the focus is always on results. It may look good, smell good and feel good, but if it does not "work", it will not be found in the Sothys line. It is this dedication to creating the best professional skin care products in the world that has lead to a huge following by professional estheticians. After all, their business depends on offering their own clients immediate, discernible results. With Sothys, they know they can give them. Sothys, the brilliant and precious star shone brightly throughout the skies, grasping the awe of the people in Egypt on clear blue nights. She was the most beautiful and luminous star of them all. Her unique distinction, unlike the other stars, captured the admiration and fascination of all men. Sothys' temptations of passion were unique and she surpassed all immortal beauty. Yes, even more beautiful than the Goddess Venus. The great God, Saturn, during his course of celestial adventures, discovered the innocent and precious star. Marveled by her appearance, he was entrapped by her passion and madly enveloped with her unique beauty. For many centuries, the Universe was deprived of the luminous star. The saddened Saturn, torn with grief, filled the lands with his tears of sorrow for many days. It then rained for 40 days and 40 nights. Could it have been Saturn's grief that created the Great Floods ...? And so, in response to Saturn's beloved loss, the brilliant Sothys returned to us, as a new star reigning over the Universe. Her gentle rays sweep over the lands and heavens radiating her beauty and magnetism to all women and men over the world .. Forever.. Ever since Sothys started specializing in extraordinary treatment concepts and products, it has done so in a simple, easy to understand fashion. We believe that even the most sophisticated high tech ingredients and delivery systems are not effective if the skin isn't properly cleansed and prepared. As a result, the following represents our treatment philosophy. Also, please keep in mind that professional facial treatments in the salon are vitally important but still don't hold a candle to the importance of proper home care. The simple fact is that no matter how great the treatment is in the salon even if on a weekly basis, the home care routine the client performs twice daily, 60 times a month, is even more important. An esthetician must ensure that the client is on the proper home care routine, not just for the sake of sales and income, but to support and solidify the effectiveness of the salon treatments. When a client uses this product and that product at home, on a hit and miss basis, the possible results are hindered. We urge our clients to follow our home care recommendations, whether purchased as a set immediately after the first treatment or over a month's period of time, the ultimate success of treatment is dependent on the continuity of product usage, return salon visits, and personal concern and interest on the part of the esthetician. The Sothys routine is simple,easy to begin within a reasonable budget and yet offers great room for growth and adaptation with client experience. The line can simply be divided into three major categories: Basic Care, Specialized Care and Intensive Care. Our treatments include the basics, specific salon treatments normally not retailed, and then a group of highly sophisticated Institute Treatments that allow for unsurpassed skin appearance rejuvenating effects. Additionally, the home care products follow this simple concept. First we have one eye make-up remover, 4 cleansers and lotions (or toners) for the four basic skin types: normal combination, dry/dehydrated, sensitive, oily/acne. For further deep pore cleansing and exfoliation, we offer the world renowned Desquacreme and Gommage Peel along with a Morning Washable Cleanser. We then divide the line into 2 major groups of day/night cremes, masks, serums (ampoules for salon use): (1) Basic based on the four basic skin types along with a special range for redness; (2) then four more specialized groups for Hydration, Firming, Oxygenating and Aging Skin. We then offer the ultra important group of Intensive Care products which coincide with our exclusive Institute Treatments as well as other specific issues. To finish out the complete line, Sothys offers a full range of sun care, body care, bust care, and make-up products. The make-up line offers the best of French great skin care including a treatment ingredients, protectants, hydrators, and beautiful Parisian color stories. A facial is a cosmetic treatment of the face, commonly involving a variety of skin treatments, including: steam, exfoliation, extraction, creams, lotions, masks, peels, and massage. Normally performed in a beauty salon but it is also a common spa treatment. There are a number of different facials including gold facial, pearl facial, and even diamond facials. Each one has a different effect on the skin. Qigong (or ch'i kung) refers to a wide variety of traditional “cultivation” practices that involve methods of accumulating, circulating, and working with Qi or energy within the body. Qigong is sometimes mistakenly said to always involve movement and/or regulated breathing; in fact, use of special methods of focusing on particular energy centers in and around the body are common in the 'higher level' or evolved forms of Qigong. Qigong is practiced for health maintenance purposes, as a therapeutic intervention, as a medical profession, a spiritual path and/or component of Chinese martial arts. The 'qi' in 'qigong' means breath or gas in Chinese, and, by extension, 'life force', 'energy' or even 'cosmic breath'. 'Gong' means work applied to a discipline or the resultant level of skill, so 'qigong' is thus 'breath work' or 'energy work'. The term was coined in the twentieth-century and its currency, Ownby suggests, speaks of a cultural desire to separate 'cultivation' from 'superstition', to secularize and preserve valuable aspects of traditional Chinese practices. Attitudes toward the scientific basis for qigong vary markedly. Most Western medical practitioners and many practitioners of traditional Chinese medicine, as well as the Chinese government, view qigong as a set of breathing and movement exercises, with possible benefits to health through stress reduction and exercise. Others see qigong in more metaphysical terms, claiming that cosmic qi can be drawn into the body and circulated through channels (aka meridians). For the Japanese era name, see Reiki (era). Japanese reiki 霊気 "mysterious atmosphere; spiritual power" is a loanword from Chinese lingqi 靈氣 "spiritual atmosphere (esp. of mountains, shrines, etc. ); vitality; ingenuity". This Japanese compound joins rei or ryō 霊 "ghost, spirit, soul; supernatural, miraculous, divine" and ki or ke 気 "gas, air; breath; energy; force; atmosphere; mood", here meaning qi "spiritual energy; vital energy; life force". Besides the modern Japanese pronunciation reiki, 霊気 has an archaic literary pronunciation ryōge "demon; ghost". Both these Japanese kanji are graphic simplifications of Chinese characters: rei 霊 from ling 靈 (with 雨 "rain", 3 口 "mouths" or "raindrops", and 2 巫 "shamans", depicting "prayers for rain; rainmaking"), and ki 気 from qi 氣 (with 气 "steam" rising from cooking 米 "rice"). Some reiki 霊気 translation equivalents from Japanese-English dictionaries are "feeling of mystery", "an atmosphere (feeling) of mystery", and "an ethereal atmosphere (that prevails in the sacred precincts of a shrine); (feel, sense) a spiritual (divine) presence" The Japanese writing system differentiates reiki meanings between kanji characters 霊気 "mysterious atmosphere" and katakana syllabary レイキ "method of complementary medicine". Three synonymous terms are Usui reiki shiki ryoho 臼井式療法 "Usui style healing", Usui reiki ryoho 臼井靈氣療法 "Usui reiki therapy", and Usuidō or Usui no michi 臼井道 "the Way of Usui". Look up reiki in Wiktionary, the free dictionary.English reiki or Reiki transliterates a Japanese loanword. Reiki is syntactically used as a noun (referring to either "the putative energy" or "the therapeutic method that uses it"), a verb, or an adjective. Some authors like Hawayo Takata (below) translate reiki as "universal life energy". This coinage avoids the negative "mysterious, spooky" connotation of reiki but partially mistranslates: ki means "life energy" — rei does not mean "universal". A Japanese man Mikao Usui臼井甕男, is credited with creating Reiki in 1922 after a twenty-one day retreat on Mount Kurama, involving meditation, fasting, and prayer. Usui said that by mystical revelation he had gained the knowledge and spiritual power to apply and attune others to what is called Reiki. In April 1922, Usui moved to Tokyo and founded the Usui Reiki Ryoho Gakkai (Usui Reiki Healing Society). "The secret method of inviting good fortune. Every morning and every night, sit in the Gassho position [hands held palm-to-palm] and speak these words out loud in your heart. For the evolution of body and soul, Usui Reiki Ryoho" - Mikao Usui, the founder. Usui taught over 2000 students to use Reiki. Sixteen of his students continued their training to reach the Shinpiden level, equivalent to the Western third degree, or master level. Hayashi initiated and trained Hawayo Takata, who travelled widely in the USA, practising Reiki and teaching the first two levels to others. Takata stressed the importance of charging money for Reiki treatments and teachings. In 1976, Takata began teaching the Shinpiden stage and introduced the term Reiki master for this level. She also fixed a price of $10,000 for the master training. Takata died in 1979 by which time she had trained 22 Reiki masters. Almost all Reiki taught outside Japan can be attributed to her work. Reiki teachings claim that there is an inexhaustible, universal "life force" spiritual energy, that can be used to induce a healing effect. Believers say that anyone can gain access to this energy by means of an attunement process carried out by a Reiki Master. Claims for such energy have no known theoretical or biophysical basis. Reiki is described by adherents as a holistic therapy which brings about healing on physical, mental, emotional and spiritual levels. The belief is that the energy will flow through the practitioner's hands whenever the hands are placed on, or held near a potential recipient, who can be clothed. Some teachings stress the importance of the practitioner's intention or presence in this process, while others claim that the energy is drawn by the recipient's injury to activate or enhance the natural healing processes. Going further, the belief is that the energy is "intelligent", making diagnosis unnecessary. A second level of training, including another initiation, is said to equip the practitioner to perform Reiki treatments from a distance. This method, it is stated, involves the use of special symbols to form a temporary connection between the practitioner and the recipient, regardless of location, and then to send the Reiki energy. Techniques are also taught whereby Reiki can be sent to a specific point in time, either in the past or the future. In a typical whole-body Reiki treatment, the practitioner asks the recipient to lie down, usually on a massage table, and relax. Loose, comfortable clothing is usually worn during the treatment. The practitioner might take a few moments to enter a calm or meditative state of mind and mentally prepare for the treatment, that is usually carried out without any unnecessary talking. The treatment proceeds with the practitioner placing his hands on the recipient in various positions. However, practitioners may use a non-touching technique, where the hands are held a few centimetres away from the recipient's body, for some or all of the positions. The hands are usually kept still for 3 to 5 minutes before moving to the next position. Overall, the hand positions usually give a general coverage of the head, the front and back of the torso, the knees and feet. Between 12 and 20 positions are used, with the whole treatment lasting 45 to 90 minutes. Some practitioners use a fixed set of hand positions. Others use their intuition to guide them as to where treatment is needed, sometimes starting the treatment with a 'scan' of the recipient to find such areas. The intuitive approach might also lead to individual positions being treated for much shorter or longer periods of time. It is reported that the recipient often feels warmth or tingling in the area being treated, even when a non-touching approach is being used. A state of deep relaxation, combined with a general feeling of well-being, is usually the most noticeable immediate effect of the treatment, although emotional releases can also occur. As the Reiki treatment is said to be stimulating natural healing processes, instantaneous 'cures' of specific health problems are not usually observed. A series of three or more treatments, typically at intervals of 1 to 7 days, is usually recommended if a chronic condition is being addressed. Regular treatments, on an on-going basis, can be used with the aim of maintaining well-being. The interval between such treatments is typically in the range of 1 to 4 weeks, except in the case of self-treatment when a daily practice is common. Localized Reiki treatments involve the practitioner's hands being held on or near a specific part of the body. Recent injuries are usually treated in this way, with the site of injury being targeted. There is great variation in the duration of such treatments, though 20 minutes might be typical. Some practitioners use localized treatments for certain ailments, and some publications have tabulated appropriate hand positions. However, other practitioners prefer to use the whole body treatment for all chronic conditions, on the grounds that it has a more holistic effect. Another approach is to give a whole body treatment first, followed by a localized treatment.